Now this sounds delicious and decadent! I think I’ll be trying the chocolate top oatmeal cookies pretty soon. 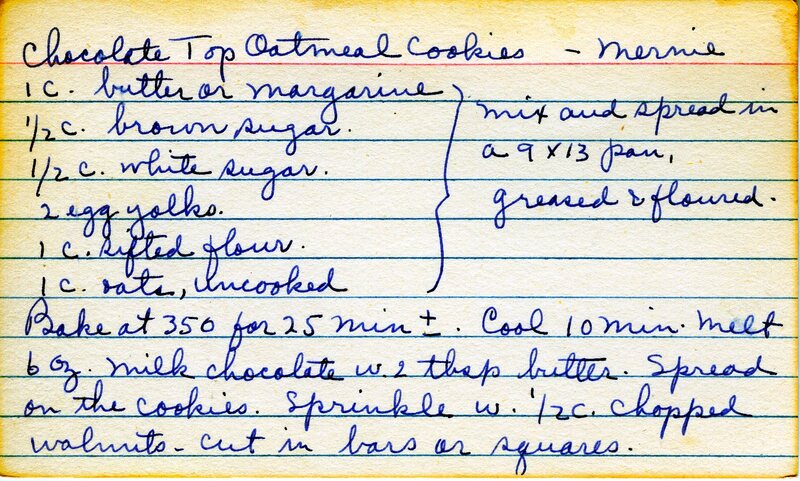 Here’s another recipe from Mernie – who’s full name is Marian, in case you are interested. Bake at 350 for 25 min +/-. Cool 10 min. Melt 6 oz milk chocolate w 2 tbsp butter. Spread on the cookies. Sprinkle w. 1/2 c chopped walnuts. Cut in bars or squares.